Early Friday morning, March 18, the Albright Haiti team of 8 departed Winnipeg to make their way to Gens De Nantes, Haiti. 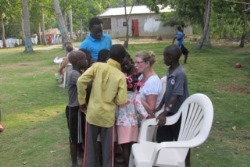 After connecting in Montreal and overnighting in Miami the team touched down in Cap Haitien Saturday morning and made their way through security to meet up with Marilyn McIlroy. They enjoyed the ride from Cap Haitien to Gens de Nantes in an air conditioned bus, snacking on crackers and cold soda. After stopping in Ouanaminthe, so Eric could check out the local hardware store for supplies, they carried on until they arrived at the Guest House in Gens de Nantes. The guesthouse staff and clinic leadership had prepared for the teams arrival by scrubbing the house, making beds, washing the mosquito nets, planning menus, purchasing food and snacks, and made other preparations for their ministry there. So, after so much preparation, it was no surprise that the team arrived to a wonderfully dinner prepared just for them. Saturday, March 29, after dinner the team settled in to do the initial tasks of unpacking suitcases and supplies, hanging mosquito nets, and then discussing the unfolding plans for their time there. Although their travels went well they looked forward to a good night sleep. This is the day that the Lord has made and we are rejoicing and will be glad in it!!! After a good sleep for most of the team, they shared breakfast together enjoying the good food and extra good coffee. Eric (McGyver) caught a mouse the evening before so the guesthouse was one resident short that morning, much to everyone's relief. Before walking to the Palm Sunday service they had devotions and a time of prayer. An awesome time of worship was followed by a time of greeting friends and familiar faces, practising creole along the way. Their day was spent playing and reading with the children, troubleshooting and fixing the clinic fridge and listening to their translator Guy, who is new to the team and to the community of Gens de Nantes, share his testimony and joy at being with the team. They shared a well prepared dinner and then debriefed at the end of day sharing highs and lows; it was a productive yet relaxing day. There was great joy for the team members who first met Elizanne in 2014 and met her again. There was great disappointment for some students in the community who were turned down from attending the English classes due to class size and other criteria. There was much to do as the Haiti team got into full swing. The Haitian proverb of the day, Bitay Fe w avanse - stumbling moves you forward, has never been truer. At least that's what it felt like for Eric Handyman McGyver, who trapped mice, obliterated an ant infestation, finally found the ever so important Dewalt charger, and attempted to work on plumbing at the Medical Staff house with Haitian handyman Lolance. The HOT weather provided an extra challenge. The English class moved forward with Laurie and Jen teaching in the morning. Even the afternoon class, with Rob and Lorna, moved forward despite the delay as the clinic staff found it hard to leave their tasks there. In due time they made their way and the class carried on. The Health Team moved forward today, the first day in the clinic for Stephen and Marilyn working with the new Gens de Nantes doctor, Emmanuel. Marilyn spent her day putting together iv bag setups in the clinic so everything is in one place when someone needs an urgent iv, and organizing meds for the pharmacy. She provided a finger dressing for a young woman with an infection and generally delighted in reacquainting with staff and being back in the clinic. Presented with three cases of severe Congestive Heart Failure, Stephen relied on his clinical skills and best judgement as there are no options for advanced investigations or management. He was able to show Dr. Emmanuel some physical findings in patients with Advanced heart failure. Two of the patients were young, 40 and 25 and only one was able to receive treatment. With no medical treatment to offer the other they prayed with him to turn to God and seek Him for salvation and eternal healing. Other patients attended the clinic and received care. The evening meal of pizza, fries and salad, was a welcome reprieve from the tasks of the day. In the evening Lindsey visited with Dr. Emmanuel to get to know him a bit better and learn his story. The children who dropped by the Guesthouse grounds enjoyed seeing Evan's creative book on life in Canada. The teachers spent time preparing for the next day and Lorna and Marilyn McIlroy worked on the team's finances. The team is doing well, they are being Flexible, Adaptable, and Teachable!! Lindsey did inventory at the clinic which is an ongoing process. Eric and Lolance had a successful shopping trip and returned safe and sound. 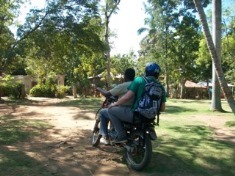 The two Marilyn's and Lindsey were on motorbikes to a vaccine clinic that morning. Supper was delicious, rice, beans, goat and beets. They all had a good day, busy with various tasks. English classes are going well. Dr. St. Hillaire is speaking a little English at supper, a good opportunity for him to practice. On their walk about with the community health avant Sante they visited 5 newborns who received the bcg vaccine. Day 2 in the clinic. Dr. St. Hillaire is apparently very appreciative for the opportunity to learn more in depth about some of the patients they are seeing together and Stephen is enjoying the teaching component very much. 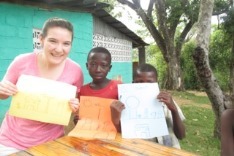 Stephen is able to free Dr. St. Hillaire up in the afternoon so he can attend the English language classes. He is very attentive and patient with his patients in the clinic. They saw a very beautiful two month old girl this morning. Big inquisitive eyes filled with life and beautiful features but she's going to die soon. She has some kind of congenital thoracic problem and has had noisy breathing from birth. There is an obvious rib cage problem but the family have been told after they've spent too much money that "there's no problem". Gens de Nantes is in reality the end of the line as far as health care is concerned for the people here. If the clinic here can't provide the care the great majority have no option available to them so they will die of disease we can usually forestall or cure in Winnipeg. It is hard to tell people there is nothing further they can do, knowing that in Canada we would never have to say that to someone in their situation. Praise the Lord! So many blessings and answers to prayer, God is Good. So good to hear the hubbub of preparing for another day. Laughter and singing inside and out. So day three in the clinic was really busy for every. There was a prenatal and vaccination clinic in addition to the usual medical clinic. Marilyn K and Lindsey watched a delivery, tiny baby boy. Then worked as a team in prenatal Clinic assessed about 20 pregnant moms, including a mother working on her 11th baby! They did brief abdominal exams and used the Doppler machine to check on the babies heart rates. Dr. Emmanuel and Stephen had a teaching time on the physical signs of heart failure and the second patient of the morning had all the physical findings. Since there are no diagnostic modalities it is critical to have good clinical exam skills. It was so neat that God placed the curiosity to know about CHF in Dr. Emmanuel's mind and a patient in the clinic to help solidify that knowledge. There were numerous kids with intestinal parasites (giardia, worms and salmonella). These are such a problem there as the water is not treated. They saw a young woman with very enlarged lymph nodes in her neck and sent a swab to look for tuberculosis and started her on treatment as they await the results. She has already lost a lot of weight. (She looks like Elizanne from last visit but this lady's teeth are pretty normal.) Dr. Emmanuel said that in the Haitian Medical System physicians will get no organized continuing medical education once they graduate. There is no official way to keep up with the latest advancements other than decrees from the department of health. Medical Journals are relatively expensive and for the most part irrelevant in a resource poor health care system. So it's a great thing that Stephen can help him out like this. The team had a delicious fish and chip dinner and enjoyed a wonderful time of fellowship around the table. Eric built an aid for the shorter members of the team, full story and pictures to follow!! Stephen and Jenn so blessed to have an affirmation of purpose. Laurie and Jen skipped with the kids in the sunshine and heat, awesome to hear the laughter and joy. For their daily devotions they have been discussing the names and characteristics of Jesus. Today: Jesus our strength. They are all working in the joy of the Lord. They have been laughing and sharing tears of joy together. Thank you to all the family and friends for all their prayers!